NEW FIGURES FROM the Nationwide UK (Ireland)/ESRI show that Irish people are still saving for a rainy day. In fact, 36 per cent of us are still putting money aside for unexpected expenses, the largest saving category. However, this is down from 46 per cent a year ago as people shift their saving pattern to pay for specific items rather than contingency funds. Ongoing employment challenges mean that the second most popular saving category is for education and training, with 19 per cent of people investing in their skill set to improve their job prospects. This is up from 15 per cent a year ago. 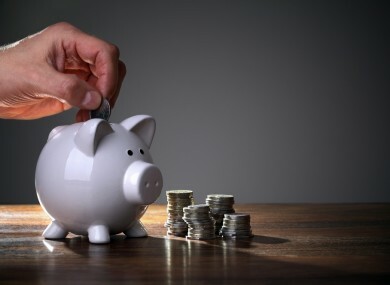 Saving for holidays or buying or renovating homes has also increased in popularity, with 14 and 7 per cent of savers putting money aside for this, up from 10 and 5 per cent a year ago. Our focus on paying down debt has remained high, but shows signs of decreasing. 47 per cent of respondents said they would use any money over what they need on a day to day basis for this, down from 53 per cent a year ago. 10 per cent of people said they’d spend it, with 39 per cent saying they would save the money. Overall, people are slightly less enthusiastic about saving than earlier in the year, with the sentiment index coming down one point to 101 when comparing April figures to the previous month. Nationwide UK (Ireland) managing director Brendan Synnott said he expects that trend to continue. We expect the overall index to decline further as the economy improves and while there has been no signifiant increase in preference to spend…there has been a noticeable change in the reasons why people save. He said that people are now saving for intended purchases rather than general ‘precautionary’ saving. Email “Here's what the Irish are saving money for”. Feedback on “Here's what the Irish are saving money for”.